Learn Hands On in the Booth! 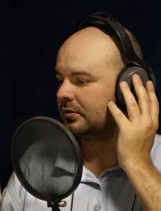 A Plus Voice Overs teaches voice acting classes using a hands on approach. You'll be in the voice over booth the very first class, breaking down copy, and recording your read. You'll walk away with your recorded audio from each class session. Classes are limited in size, assuring you more one-on-one instruction time. You'll learn along side a small, supportive group of fellow students in an interactive studio setting. Showcase Your Voice with Professional Production and Quality Direction! A Plus Voice Overs produces high quality voice over demo reels that will help you land your agent and book work. Voice Over Demo Reel Production packages start as low as $495. *Students of A Plus Voice Overs voice acting classes qualify for additional discounts! Stand Out from the Voice Talent Crowd. Your Professionally Produced Demo will Showcase Your Voice's Strengths! Copyright © 2019 Smilecom, Inc. All rights reserved. A Plus Voice Overs is a subsidiary of Smilecom, Inc.